A webcam cache for the off-season visitor to Canada`s oldest provincial park. This webcam cache is located at the Algonquin Provincial Park Visitor Centre. The webcam provides the same spectacular panoramic view as the one enjoyed by thousands of visitors each year. From the viewing deck at the Centre, visitors can see various habitats such as coniferous forests, deciduous forests, a spruce bog, Fork Lake, Sunday Creek, and more. The webcam is available for live streaming 24/7, except at the top of each hour (the camera takes a panoramic shot once each hour). Besides the live feed, achieved images area available to be viewed, stretching back to August 2013. Archive shots are collected at 2 minutes past the hour, every hour, every day. 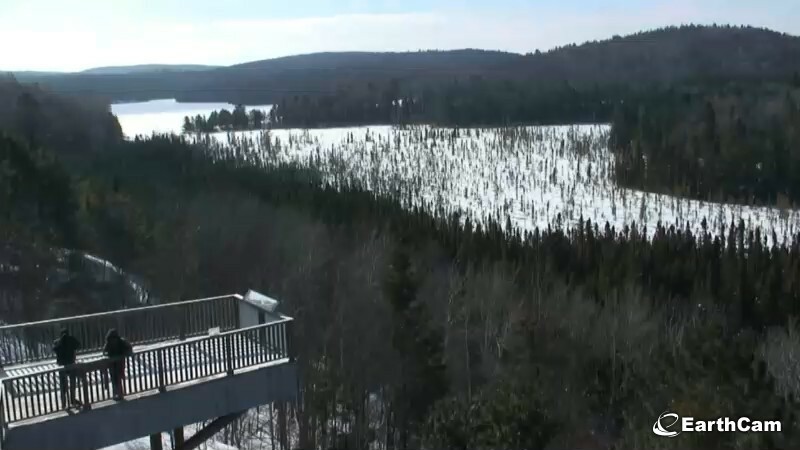 To view the Algonquin Live Web Cam, visit: http://www.algonquinpark.on.ca/virtual/webcam/index.php and click the "Live" tab. To log this cache, you must visit the Algonquin Park Visitor Centre (there is a fee to stop at any facility in the park, including the Visitor Centre. See below for more details). Once you have entered the Centre, make your way to the viewing platform and look for the section of platform which juts out from the main deck. 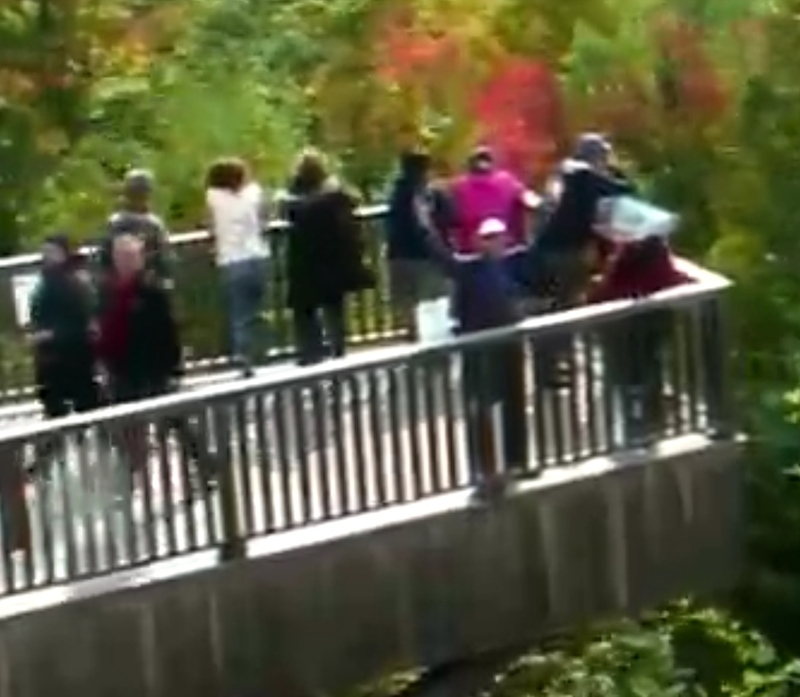 That is the section of the viewing deck which is (typically) visible on the camera feed. Typically visible? Yes, there will be times when no segment of the deck is visible. More about that in a minute. 3) Take a chance that you made it into view at the moment when an archival image was collected (2 minutes past the hour, every hour) and at a convenient time view the archives, find the image with you in it, and save it. Okay, now let me clarify what I mean when I say "the section of the viewing deck which is (typically) visible on the camera feed". When looking through the archived images, I noticed that the camera was zoomed in on the landscape for a large part of the main tourist season last year (March 18 2014 - September 21 2014), and that the viewing deck was not visible in the images. Although the viewing platform is visible in the available archived imaged from 2013 (including August). I’m not sure when and why the camera is sometimes zoomed in on the landscape. Also, there are a few days each year when the camera is focused on the bird feeders instead of being aimed on the horizon. For example, see the archived images for March 28, 2014. So, it seems that this webcam cache may be most obtainable during the fall and winter months. To save the webcam image (from a regular browser window): below the live image, there are four links above the text "Share Image" The links are, in order: Email, Save, Facebook, and Twitter. Clicking on the "Save" icon (some small yellow object) will bring up a screen with the option to save the image. On mobile devices, the option to save the image might not appear, and in those cases you will need to do a screenshot or use some other way to save the image. Algonquin Park Visitor Centre: Hours and Fees: Anyone using the park facilities, including the visitor centre, must have a valid day-use or camping permit. Permits are available from the Park Offices located at the East Gate and West Gate to the park (along Highway 60). There are a number of excellent public campgrounds located in the park, as well as a few private resorts. The Visitor Centre has limited hours during the "off-season". Check the park webpage or call the Centre before you go. "The Algonquin Visitor Centre is open with reduced services for winter weekdays (excluding holiday periods). Visit us by chance or by appointment from 9:00am to 4:00pm winter weekdays. Call ahead to confirm availability at 613 637-2828, since inclement weather and staff scheduling priorities may close the facility to visitors on some days. The Visitor Centre is fully operational on winter weekends and holidays"
Day 5 of our vacation in Canada coming from Germany. After having arrived in Huntsville yesterday, we explored Algonquin Park today. Took a look at the visitor center first and then hiked quite some trails enjoying the views and finding some caches. I also activated oc.us in my c:geo and it presented an unfound OC cache to me. Nice...seems I made the FTF on this one. Thanks for creating it, it was fun to pose and capture the picture. I am the one waving with both hands. My first find ever on OC.us by the way. Just a note that the Algonquin Park Visitor Centre Webcam Cache may be "unavailable" for a short while. Sometime in the last 90 minutes, the webcam was repositioned to focus on a moose carcass deliberately placed in the Sunday Creek Bog. I receieved the following email: "The moose carcass placed in the Sunday Creek valley off the Visitor Centredeck over five weeks ago was visited by an Eastern Wolf yesterday morning and evening, and a Bald Eagle landed near the carcass in the evening. Three wolves and a Bald Eagle have been feeding this morning." I'm not sure how long the camera will be turned out, but archived shots from earlier today suggest a good number of visitors to the park over the march break.